Well my wonderful squishy baby blanket from previous posting was rejected. Apparently the baby really will be GINORMOUS! Seriously, no one else thought it was two small to be a receiving blanket. In fact, complement of all compliments... my mom LURVED it! Seriously, that is huge. My mom may not know it but she has a comment for everything... and I mean everything. For instance almost five years ago, while we were working on wedding shopping, she made a statement about my face being "round." She also didn't see how this was deemed hurtful since (when called on it) she stated "Well it is round you want to work with what you have not make it look bad." So uh, yea.... I have one of those momma knows best, has a comment for and opinion about everything sort of mothers. However, after all was said and done and my near nine year old has his birthday party I showed my mom the blanket. She loved it. Which is nice because later that night I realized that I can't think of a time my mom has seen one of my projects FO or UFO and damned it with faint praise. That makes me feel good. It's nice to know there are some things that she'll step back and just say, "you did a good job." Not everyone has that. 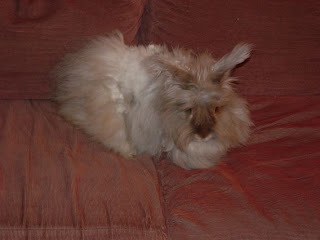 Besides the blanket we had our Angora bunny, Ladybird, pass away last weekend. Just really sad. My son was really upset but I think it was easier this time around since Opal had gone while we were still in the apartment. He was at his grandparents for the night so we waited till he came home. Some things are hard enough. We'll miss you Ladybird!